Welcome to Manly Soap Central! 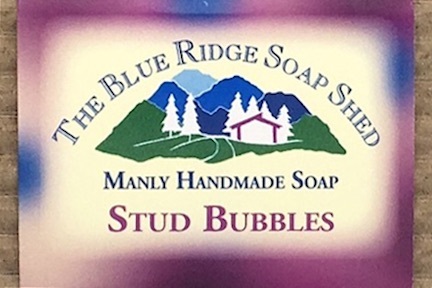 With a male soapmaker, and a business located in the Blue Ridge Mountains where whole families - not just women - come to visit, our mission was clear from the very beginning. Make Soap for Every Body in the family! The Soap Shed has developed the best selection of manly soap for men that you'll find anywhere on the Net. We know that handmade soap is not just for women, and that handmade soap doesn't have to be scented with roses, gardenia and magnolia. Handmade soap for men is simply about good skin care. We make our soap for men in fragrances men like, using traditional favorite men's scents like bay rum, bayberry, spice, lime, and musk, as well as natural essential oils like sandalwood, patchouli, and oakmoss. And we've created some special combinations, like our Avocado, Birch and Eucalyptus Shea Butter Soap for a facial soap, hand repair soaps for Hardworking Hands that are dry and cracked, and Goat Milk Soaps with a lot of lather for shaving. We've got a great selection of gifts for men here too. Just one man soap after another man soap, after another man soap. We even have an entire line of soaps that are completely unscented for those men who have sensitivities to scent, or just simply don't like fragranced products. Our woodsy scent of pure Oakmoss will rekindle that old Saturday night fever! An all-dressed-up-Sunday-go-to-meetin' kind of goat milk soap for all true Southern Gentlemen, wherever they may reside. The rich, thick lather provided by the addition of creamy goat milk make this a winner for use as a shaving soap. Six bars, one each of our Stud Bubbles, Spiced Plum Cream, Bay Rum Hand Repair, Spicy Lime, Masculine Musk and Dirty Old Man.